The last month I've seen two productions of Jonathan Larson's musical RENT. One in Athens, Greece, and other in Lahti, Finland. I thought it would be fun comparing the two, so let's see! Athens: After the ticket buying ordeal I described in my previous post I guess I kind of expected to get something in return... And besides, my online friend told me the show had gotten good reviews. However, she had also told me there are hardly any musicals in Greece. So, my expectations were somewhat medium - I was quite sure I was not going to see any West End level performances because of the lack of musical experienced actors, but then again I supposed it was going to be pretty good at least. Lahti: My expectations were all over the map. 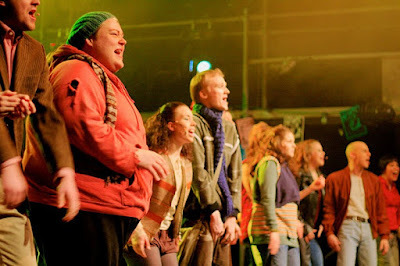 On one hand, judging by all they had said on their website, I was certain this group of people is really, really into making RENT and everyone of them is a fan of the show. 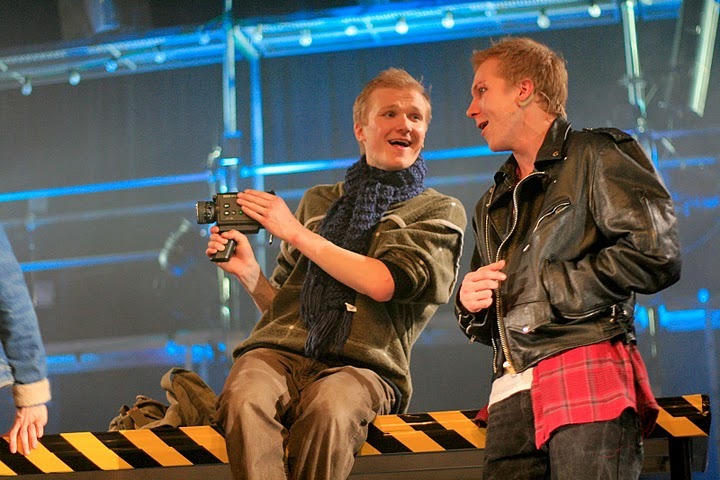 On the other, Suomen musiikkiteatteriensemble ry is a newly-formed musical theatre troupe, and RENT is their first show. I was really excited about getting to see RENT in Finland, but I also reminded myself not to get too upset if it's not that great. Athens: Me and my dad walked to the theatre through a pretty creepy neighbourhood and still arrived there about an hour too early, which messed with my mood a little. The theatre was one of those really miniature places - no place to leave your clothes in, no benches to sit on while waiting the auditorium doors to open, a lobby so small it feels packed with fifteen people. Things didn't get much better after the auditorium doors opening: the floor was almost flat, the seats weren't really comfortable and there was some totally un-RENT-like soft rock music playing in the background. And yeah, the show begun half an hour too late. Lahti: The theatre wasn't really big or fancy neither, and, due to the sponsors financing the show, there were leaflets all over the place - Stop Homophobia, Get Help to Kick Your Drug Habit, that sort of thing. Nothing offending or unrelated, but not quite what you suppose to see in a theatre. Anyway, I loved to hear the final rehearsal The Finale playing through the wall. And the auditorium actually looked like a real theatre auditorium this time! Athens: Talk about non-replica! Even though some of the costumes were like on Broadway, this was so unlike the original it's questionable if it can even be called RENT anymore or if it should be deemed an adaptation... They had, like the movie, cut all the little tunes like Tune Ups and Voice Mails. Contact was gone. Over the Moon had no music. La Vie Bohéme was partially cut. And then they had added stuff - Angel getting harassed by a skinhead, Mark introducing all principal characters of the show, Mark's mother making him marathon phone calls... Quite a mess, actually. 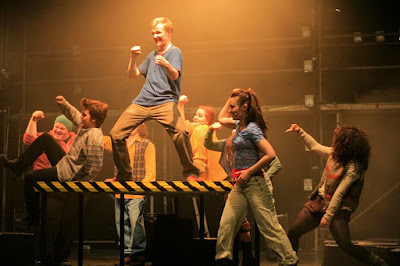 Lahti: The show, like the movie, begun with Seasons of Love, but returned to the familiar Broadway track right after that. Only two major changes were made after that: Contact was gone and - this is a shocker! - in the end, Mimi died. That's a pretty huge change if you think about it, but I liked that they had done it. I've always thought the ending is a little bit too happy for the "no day but today" message. Athens: I loved the actor playing Roger, he had a gorgeous voice and sung One Day Glory to perfection. I loved how they had, during Without You, Joanne and Maureen onstage too - the latter leaving their house and the former hugging the teddybear her girlfirend had left behind, and the latter then coming back at the end of the song. I loved Mark hugging Collins and not letting go when they think Mimi has died. And this Mark was exactly like my mental image of the character! Also, Angel coming back to sing The Finale, interacting a little with everyone in the ensemble, was really touching. Lahti: I loved how Angel wore stuff a normal woman would wear - no skimpy little miniskirt like in Athens, not the kind of weird combo of the original Broadway show, but actual, pretty normal clothing of a lady who's proud of her looks. I actually liked Contact getting removed - to me the number has always been disorienting at best and a total awkward-fest at worst. I loved how they changed the ending - as I mentioned, to me Mimi living has always seemed a bit of a stretch, a little too Hollywood. I loved the translation. Usually Finnish translations are quite literal and stick to the rhymes, sometimes on expence of the meaning of the line. But here they had put the meaning first. I don't care if a couple of rhymes are gone if the message, for once, is clear. Athens: The cuts. Most of them made no sense. Why remove the little songs and replace them with scenes that felt twice as long as the songs would've been? Even cutting Contact didn't work since they had left Angel's part - and the direction made it seem like he returned to sing beyond the grave. Creepy. Some of the cuts seemed conservative. If you can't take the sight of women kissing, don't do RENT. Also, the volume was just too loud. 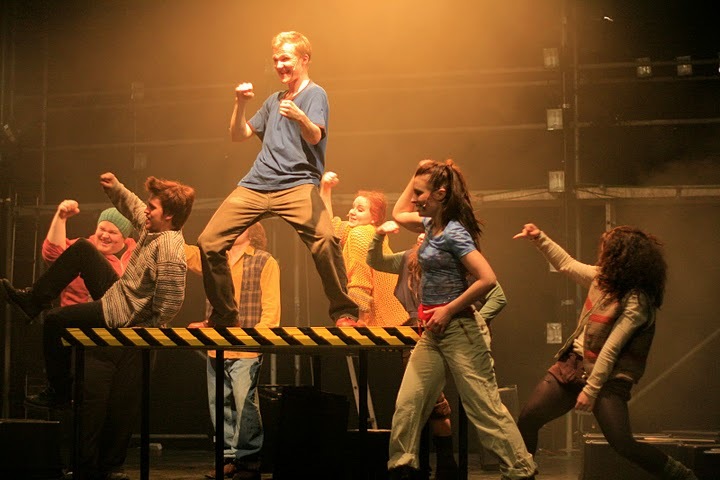 I get the rock musical part, but that doesn't mean the audience has to be deaf by the end. Still, some little directional things, like putting dancers in the background during Today 4 U. They had also made both Angel and Joanne mental blondes, the both of them being kind of ditzy and silly. Angel shouldn't be played as a comic relief! Lahti: The Angel here, Jyri Numminen, wasn't much of a dancer - but I can forgive that since he's responsible for the great translation. Then again, Mimi, Sonja Sorvola, was a good dancer but not such a great singer. I did like her more and more towards the end, though. I didn't like how they pointed spotlight right at the audience during some parts, and I'm not sure if I hate or love adding, in the style of the movie, Maureen dancing the tango in the background with a man and a woman during Tango: Maureen. Again, at some points the volume was a little too much (too quiet to use the ear plugs they gave but a little too loud to feel really comfortable), but it was not as bad as in Athens. Athens: My own mood: okay. The songs were good, as were the actors, but I hated to see the show butchered like that. Still, I felt quite emotional by the end and shed a little tear when Angel joined the final chorus. The audience's: not much. Everyone mooed politely during Maureen's performance, but claps after the songs weren't that big. Lahti: My own mood: great. I was so positively surprised - the show was much better than I had expected. Anyway, I didn't really cry this time. I guess I was just so sweeped by the generally cheery mood of the audience that I couldn't all of a sudden feel that sad. My jaw did drop open when Mimi died, though! The audience's: great. Maureen didn't ask the audience to moo, which is good. Us Finns are famously shy, so audience participation things can get somewhat awkward... But the cheers after every song were huge! There were screams when the lights dimmed for the second act and even after Voice Mails. I don't know how much of this had to do with it being the premiere and how much purely with the show's quality. But for example Wicked's premiere was, mood-wise, like watching a dead fish compared to this! Athens: A mildly enthusicastic applause in the end. They still did Seasons of Love as an encore. Is that an usual practice in RENTs around the wolrd? Seemed a little forced to me because the audience really didn't cheer that much. Lahti: The audience practically exploded. Loud screaming, clapping, banging feet on the floor, and a standing ovation (even though it apparently does happen in Les Mis all the time, still a rarity in Finland) after just a little while! I've never screamed that loudly at theatre. Then, after a while, Heikki Mäkäräinen, our Mark, signaled us to calm down and told us how the cast and crew love all of us and how they'd wish we'd tell about RENT to our friends if we were touched by it (which is of course what I'm trying to do here). It was really adorable. Then, more screaming... And the band starting Seasons of Love once again! I don't know if they'll do it every time too, but at least this time the audience had shown some real enthusiasm to get rewarded with an encore! Athens: "It was nice, but it would've been so much nicer without the weird cuts. Why did they have to do the weird cuts? Why?" Lahti: "That was great! Was that even real? Because it was too awesome to be real!" Pictures from the Finnish RENT's website. Hey, by the way, remember the time I complained how messy most of the Finnish theatre websites are? - the friend told me "the number of the theatre"
Yeah, maybe I have to think about complaining of slightly confusing websites once more. More about the production itself maybe later. Tapiola Big Band feat. Mari Palo - Diiva Svengaa!